Japanese Restaurant Minneapolis: Make Valentine’s Day Plans! Make Your Valentine’s Day Reservation Today! It may not seem like it, but Valentine’s Day is less than a month away! 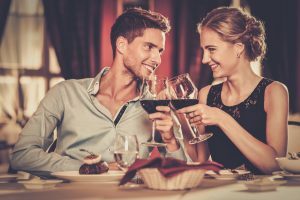 While you may not be one who’s much for planning a big night, it can be nice to go out with your special someone for a nice dinner and perhaps a drink or two. At Moto-i, we love having couples stop by on Valentine’s Day, whether it’s for dinner or to enjoy a cocktail before they catch a movie or a live show. If you’re in the mood for amazing Japanese cuisine this year, make your reservation today! If you’ve been in a relationship for some time, you may feel like things are beginning to become a bit stagnant or predictable. You both watch the same thing on TV, or you go to the same restaurant all the time. Trying new things can put the spark back into the relationship, and one way to do that is to try different types of food. If you’ve never had traditional Japanese ramen before, or you’ve always wanted to try sake, but didn’t know where to start, we can help. With our extensive menu, you can start with appetizers such as miso soup or miso popcorn. Our rangoons feature shishito peppers, bacon, cream cheese, scallions, and a sweet chili sauce, making them a great starter option. From there, you can move onto salads and veggies, such as our beet salad or brussel sprouts. We have vegetarian and vegan options available, so be sure to ask your server if that is something you require. For the main course, it can seem challenging to pick just one option. Our large plates can be customized with your choice of noodles and protein, so you could go with Yaki Udon, which are spicy udon noodles with carrot, cabbage, scallion, ginger, garlic, bean sprout, chili flake, and bonito, and add chicken, beef, pork, or mock duck to them. We also have shrimp and tofu available, if that’s more your style. You can also add any protein to our Drunken Noodles, which are spicy rice noodles with scallion, bean sprout, garlic, ginger, Thai chili, Thai basil, onion, and sesame seed. If you’ve never had traditional ramen before, you may not be sure where to start. Our staff can offer their recommendation based on your preferences, and they’ll gladly answer any questions you have about our menu. The Classic Pork Ramen is always a great choice, and comes complete with smoked pork shoulder, pork belly, scallion, chili oil, togarashi (a chili spice), a poached egg, and pork broth. We also have chicken, mushroom, miso, beef, and vegetable ramen options. No Valentine’s Day Dinner is complete without dessert, and Moto-i is proud to offer some delectable options. Our Sata Andagi are Okinawan donuts that are covered in a five-spice sugar. We also have banana egg rolls, which features a fried wonton wrapped in banana, with Sebastian Joe’s ice cream, caramel, and sesame seeds. If you’re in the mood for mochi, be sure to ask your server for that day’s selection. February 14th is on a Wednesday this year, so you may not feel like staying out too late, especially if you have to work the next day, but with a reservation at Moto-i in Minneapolis, you can enjoy a fantastic meal, try sake for the first time, and be home before the clock strikes ten o’clock. If you do want to stay out late, we’re open until 2:00am every night, and we’re always happy to see new faces! 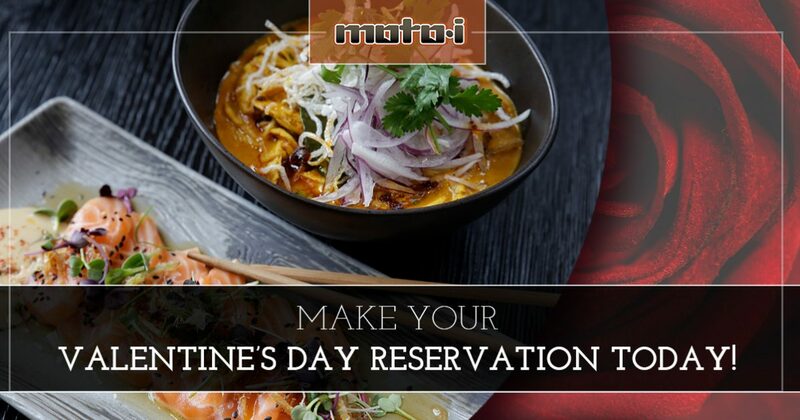 Reserve your Japanese restaurant Valentine’s Day date today!